I haven’t had time to blog. I’ve been too busy chasing jazz across the Twin Cities. The past two weeks have given me a taste of the life of a jazz fiend in Manhattan. And I’m not sure the grass –or perhaps the brass—is any greener on the far east side of the continent. Our home grown musicians are on par with any, and the finest from around the country are often on stage just down the street. And some nights, there’s too many choices. Let’s go back a weekend. 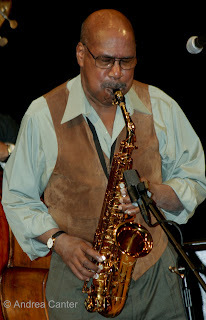 On February 29th, one could hear the very fine MacPhail Center for Music faculty in their annual recital—a faculty that includes the likes of trumpeter Kelly Rossum, saxman Greg Keel, vocalist Vicky Mountain, guitarist James Allen….and from MacPhail you could hop across the river and hear 88-year-old tenor sax legend Irv Williams celebrating the release of his fourth recording in four years. This guy has a very different take on the concept of “golden years.” I missed both, making the tough decision to attend a mixed media performance at the Center for Independent Artists, a collaboration of poets, actors and musicians putting the words of poet Sterling Plumpp—his ode to Charlie Parker-- together with the sounds of early bop and the instruments (including digideroo) of Douglas Ewart. It was a tapestry of word, music, photography and painting, flowing like a bebop tune with infinite variations of presentation. Along came the annual Twin Cities Winter Jazz Festival on March 2nd, held this year most thankfully at the new MacPhail Center for Music building, making good use of every performance space, fabulous acoustics and a line-up with something for everyone, from snappy big bands and edgy brass ensembles to a revolving line-up of hot vocalists, student bands and clinics, and the best nightcap, the Sonny Fortune Quartet. The food, catered by local chefs, matched the high standards of the music with urbane flair (and a lot of garlic). Including funkmeister Maceo Parker in this mix may be a stretch musically; while I don’t doubt he could play some hot jazz licks, at this point in time Parker is a performance package in slick wrapping, and he would probably bring in an SRO crowd even if he left his sax at home. He’s gone to James Brown Marketing School and it works—the Dakota was totally sold out even for the late set on March 3rd. But with the strutting and honking and grinning came a sound system best suited for Target Center or even Yankee Stadium. Maybe it would sound great through the Dakota’s own audiophile system. I’ll never know. The ear plugs barely preserved my hearing for the rest of the week. The rest of the week? Even Manhattanites would drool. Northrop Jazz brought in a unique double header, starting out with a legend’s legacy and ending with a legend and his brood of will-be stars. Ravi Coltrane spent years avoiding his father’s shadow, only to come out and cast a spell of his own, brandishing the instruments that were mythic props for John Coltrane. 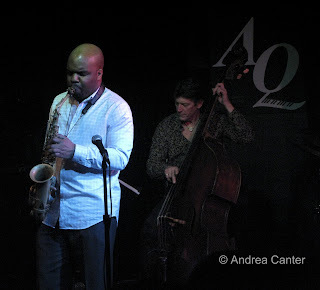 His very tight band—Luis Perdamo on piano, Drew Gress on bass, EJ Strickland on drums-- does justice to both the son and the father, blazing through a mostly original repertoire that ended, surprisingly, in “Giant Steps,” perhaps a symbolic gesture hinting at young Coltrane’s journey. Then it was time for the Giant himself, drummer Roy Haynes. Days shy of his 83rd birthday, Jazz’s Energizer Bunny might be a good foil for Irv Williams, but these days he nourishes a “Fountain of Youth” on tour and in the studio. Two years ago he recorded live sets at the Artists Quarter, releasing the result a year ago (Where As), and on March 6th brought his quartet to Ted Mann for a 90-minute meltdown. The stage barely cooled from Ravi Coltrane’s efforts, Haynes quickly peeled off his brocade jacket, rolled up his sleeves, and drove through his familiar, passion-filled book of bop magic. Keeping up with Roy is not for the faint-hearted, and only the likes of such young lions as Martin Bejerano (piano), David Wong (bass) or award-winning alto sax master Jaleel Shaw could meet the challenge. Yes, I’ve heard this band raise the roof with “Trinkle Trinkle,” “Summer Nights” and “James” several times over the past three years, but somehow it never seems tired, and Roy’s take on “My Heart Belongs to Daddy” is simultaneously bright and dark. The switch to Daylight Time notwithstanding, the temptation to take in a really late set was too strong, and from Jaleel and the AQ it was just a ten-minute dash to the Dakota for one of the best of its “Late at the Dakota” series of mostly new music. This weekend’s closing band –the Kelly Rossum Quartet—expanded to include Houston-based tenorman Woody Witt and his long-time collaborator, pianist Joe LoCascio. I first heard Woody when he came to town a couple years ago to record with old college pal Kelly. In fact Woody provided my first encounter with the bass saxophone. But on the Dakota stage, in front of an audience largely left over (and perhaps soon to be hung over) from the more conservative sounds of the prime time show, Woody stuck to the tenor and the band scattered the club with original compositions and Woody’s deconstruction of “Footprints.” It’s also a standout, 16-minute track on his Live at Cezanne’s, one of my favorites of the past year. Live at the Dakota, the Wayne Shorter classic emerged from another tune (actually a trilogy of Witt-icisms) with bassist Adam Linz leading a dirge as each musician found his own “footprint” and cut his own path in the sonic sand. Home at nearly 2, suddenly nearly 3. In New York we might be flagging a cab and recounting the fabulous music of the night, or of the past week. And so it goes in the Mini-Apple. Maybe it’s on a smaller scale, but there’s still only so many venues, so many gigs one can attend at a time. I love visiting New York. But I love living here. The music is nonstop. Photos: 1) Spoken word and music provide a tribute to Charlie Parker at the Center of Independent Artists. 2) Sonny Fortune headlined the Winter Jazz Festival. 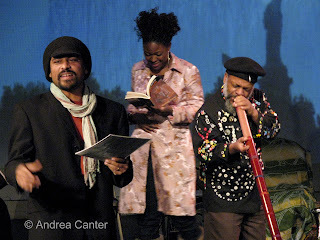 3) Jaleel Shaw at the Artists Quarter with Billy Peterson. All photos by Andrea Canter.